Malacology Laboratory, Department of Zoology, D.D.U. Gorakhpur University, Gorakhpur, Uttar Pradesh, INDIA. Objective: To observe the toxicity of chlorophyllin against Lymnaea acuminata to control fasciolosis caused by liver fluke fasciola gigantica, very prominent in eastern region of Uttar Pradesh. Materials and Methods: Ten snails Lymnaea acuminata were placed in a glass aquarium containing 3 L of dechlorinated tap water. These snails were treated with different concentrations of chlorophyllin. 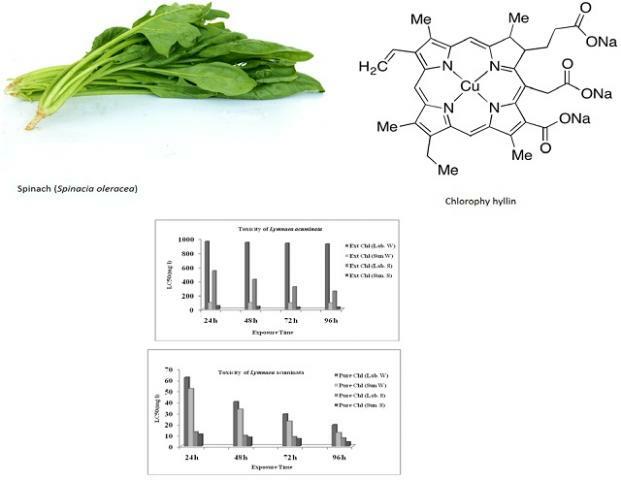 Chlorophyll was extracted from spinach with the help of macerated leaves and kept for 2 h in 100% ethanol at 55ºC. Results: The results of the experiment showed that the photodynamically active chlorophyllin, at low concentration was able to kill the snails under exposure of solar radiation in summer season instead of winter season. In winter, extracted chlorophyllin toxicity against L. acuminata in sunlight (96 h LC50 91.82 mg L-1) /laboratory condition (96 h LC50 921.93 mg L-1) was less than pure chlorophyllin in sunlight (96 h LC50 12.05 mg L-1) /laboratory condition (96 h LC5019.22 mg L-1), respectively. In summer, pure chlorophyllin was more toxic in sunlight (96 h LC50 3.90 mg L-1) than laboratory condition (96 h LC50 7.18 mg L-1). Pure chlorophyllin is more than five times toxic than synthetic molluscicides. Treatment of chlorophyllin caused no toxic effect against the fish (Colisa fasciatus). The result presented in this paper is found very beneficial and ecologically safe, as a photodynamic substance chlorophyllin, which found in every green plant. Conclusion: Phytotherapy of snails by photodynamic water soluble chlorophyllin to control fasciolosis can be used as potent molluscicides with low cost and easily biodegradable. Singh K, Singh D., Singh VK. Chlorophyllin Treatment Against the Snail Lymnaea acuminata: A new tool in Fasciolosis Control. Pharmacognosy Journal. 2017;9(5):594-598.